Nicholas Schmitt is currently attending Shimer College in Chicago. He will be entering his senior year in the fall of 2007 and completing his Bachelor of Arts in Humanities. Nicholas plans to obtain his Master of Fine Arts in Creative Writing. Although he initially planned to attend the University of Iowa, since he intends to move to California in the near future, he may attend a graduate program on the West Coast. 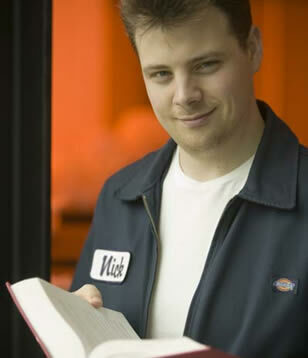 Nicholas enjoys writing short stories, poems, and short skits/plays. He aspires to write novels in a full-time capacity once he graduates with an MFA. He also would like to teach and help students learn how to write creatively. Currently, his schedule is packed with academics, and he has little spare time to devote to his chosen craft. He spends 60+ hours per week studying and preparing for class. Nicholas has earned several scholarships from Shimer College, including the Alexandra Culbertson Scholarship and the Shimer College Scholarship. When he is not studying, Nicholas likes to visit museums in Chicago. He is originally from Portland, Oregon, and is really enjoying his time in Chicago (though he misses the easy access to the wilderness and the opportunity to go camping!). He tries to find time to play pick-up basketball and an occasional intramural football game. Papercheck would like to thank all applicants for submitting their essays to our second semi-annual scholarship award. We received over 100 submissions. All applicants should be proud of their academic accomplishments and achievements; thank you for sharing your goals and dreams with us. Please come back and visit Papercheck in the future.